Bill Demong produced a devastating display in the cross-country race as he overhauled the pack to win the 10km individual large hill world title in 2009 just days after heartbreaking mishap deprived the US a chance of a team medal. It was a fairytale finale to Demong's championships in Liberec, Czech Republic who also added bronze in the normal hill event, though he will forever be haunted by losing his bib, which forced the US to pull out of the team event. His finest hour came on the final day of February 2009 when he began the cross-country section of the Nordic combined event in seventh spot following the ski-jumping. Frenchman Jason Lamy-Chappuis had a good lead after finishing top of the ski-jumping but Demong was driven on by his gaff days earlier and caught the leaders with 4km to go. It then came down to a battle between the American and Germany's Bjorn Kircheisen as the two men approached the stadium. Demong turned in a final burst down the stretch to win the biggest race of his career. The diminutive New Yorker showed signs of promise when he anchored the US team to gold at the 1999 world junior championships, two years after making his World Cup debut. When he picked up his first World Cup victory in 2002, all the signs were there that this was the beginning of a glorious passage. But he fractured his skull while diving into a hotel swimming pool in Germany in 2002 and his career hit the brakes for several seasons before he got back to winning ways in a World Cup event in 2007 at Lahti. Vancouver will be his fourth Games. As a 17-year-old he forced his way into the US team at Nagano finishing 34th, four years later on home snow he then helped the US team to fourth spot. Turin 2006 set the background for a third Olympic appearance but he was well off the pace and finished down the rankings. He also won a proud silver at the 2007 world championships coming home behind the great German Ronny Ackermann. He warmed up for the 2010 Games with his best season to date in 2008-09 winning five World Cup events including a victory at the site of the Olympic competition at Whistler and the prestigious Kings Cup at Vikersund, Norway. Since Demong lost his bib before the 2009 world team event when it fell into his boot, he has taken to putting it around his neck before competition. 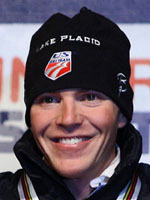 His solid jumping and excellent cross-country skills will certainly put Demong, his world champion teammate Todd Lodwick and the Americans, firmly in contention for a first ever Olympic medal in Nordic combined.